Non-toxic, eco-friendly adhesive repairs a variety of fabrics from cloth to leather, easily and fast—without sewing. Tear Mender is made in the USA and is the product of a multi-generation, family-run company. This 6 oz. + 1 oz. kit can only be found on The Grommet! Dimensions (in packaging): 2" x 2" x 6"
I know how to sew, even have a sewing machine, but this product is fantastic. It's quick and easy; especially great for an emergency . One bright side of the lousy economy is that we’re all a little less wasteful and more apt to fix, rather than replace, damaged goods. During the 1930s, Val “the Bish” Cismoski came up with a way to quickly repair canvas belts on steam-powered machinery, so farmers wouldn’t have to lose precious harvesting time to replace a torn belt. Fast-forward 75 years, and we’re putting the same formula to use mending ripped clothes, torn seat cushions and frayed shoelaces. Tear Mender is a natural and non-toxic liquid adhesive that bonds fabric upon contact. You can apply it like glue on a tear, or spread it on a fabric patch, and it bonds in minutes. Repaired fabrics stay flexible and soft even after washing, says Jerry Cismoski, (on the left) who is the Bish’s son and runs the third-generation company. So if you’ve got a dropped hem, a broken belt loop, or a run in the carpet, give Tear Mender a try. It also works great on tears in the seat of your car, damaged sports gear, or rips in a tent (it’s waterproof and UV-resistant). 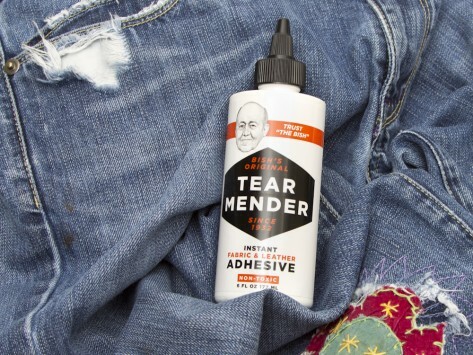 Why throw out something that you can easily repair with Tear Mender?